Lahore, Pakistan -- ITALIAN academicians and practitioners have been involved in conservation and restoration measures across Pakistan since the early 1980s. A museum at the PTDC Skardu motel is also a testament to the Italian excavation teams and their efforts within the Buddhist sites in northeastern Pakistan. As early as 1956, Giuseppe Tucci, an Italian expert on Oriental religions, especially Tibetan culture and history, had visited Swat Valley from his base in Tibet in an attempt to discover the origins of Tibetan Vajrayana Buddhism. Swat and its environs have been subject to much archaeological interest since his initial visit. Faccenna helped initiate the Italian Archaeological Mission (IAM) in Pakistan and led and oversaw numerous excavations in the country’s northeastern areas. The book gives a detailed account of the excavation developments within the Butkara region of the Swat Valley since the early 1980s with regard to three prototypical construction types. 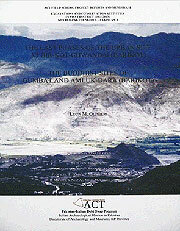 The Last Phases of the Urban Site at Bir-Kot-Ghwandai (Barikot): The Buddhist Sites of Gumbat and Amluk-Dara (Barikot) by Luca M. Olivieri talks at length of the specific findings at the Barikot site in the Swat Valley, which was explored in 1984 and revealed unprecedented urban morphology in its street planning and residential design. Both books are thoroughly illustrated with detailed drawings and photographs of the sites and the individually documented buildings. Numerous Buddhist monuments are scattered across the Swat River Valley. The monuments in the Valley were rarely standalone edifices. They were part of a complete cluster of functionally related buildings. For the purposes of the Italian-led excavations, a 40- kilometre belt on both banks of the river was divided into various zones. On the far east, near Mingora and Saidu Sharif, were the older monuments. To the east lay the Barikot and Haibatgram sites. Interestingly, almost all of the monuments are on the south bank of the Swat River. This might have to do with the fact that the larger river had numerous smaller tributaries meandering upwards from the south and the land was hence more suitable for small settlements. Consequently, a majority of the monuments listed in the book are very close to a stream or river bank to the south of the river. Since the early 1980s, individual teams consisting of Italian experts and Pakistani officials had been working on these sites along the river, but there had been no effort to compile the work in a comprehensive manner. In 2000, Italian researchers also began to draft an archaeological map of Swat including details of the excavation trenches. Archival records, including reports, photographs, technical drawings, as well as sketch notes by Faccenna himself, which later contributed significantly in the compilation of these books, kept on increasing over the years. It was fairly recently that Faccenna’s colleagues decided to compile the decades of research and fieldwork into book form for the general audience. In the introductory note on Domenico Faccenna in the Buddhist Architecture in the Swat Valley, Olivieri gives an overview of the developments of the IAM in Pakistan and its activities over the decades, including the founding of various research initiatives and the funding of field excavation projects in collaboration with local bodies. The IAM has to its credit the discovery of several significant protohistoric landmarks in the region, including residential units, communal spaces and graveyards, as well as later monuments from the Islamic dynasties. The most significant asset the IAM has possessed in all their field work over the years has been the local populace that, at the inception of the project, had little idea about the cultural heritage they were living amongst. Rather than bringing in skilled teams of archaeologists from abroad, the IAM focused on creating awareness amongst the local populations and tried to involve them in the technicalities of the conservation efforts. This measure also created local jobs and a newfound pride in formerly overlooked heritage. The setting up of a collaborative mechanism between foreign experts and the locals also led to the establishment of the Archaeology-Community-Tourism (ACT) Field School. The Department of Archae­ology and Museums, Pakistan, and the federal government of Pakistan, also supported the ACT field school institutionally and by providing land and administrative resources. The ACT venture was also financially supported by the Pakistan-Italian Debt Swap Agreement (PIDSA), a programme initiated by the Italian Cooperazione allo Sviluppo. The Coopera­zione allo Sviluppo, operating under the Italian Ministry of Foreign Affairs, declares local culture as a valuable asset for exploring and enhancing local economic opportunities. This programme was the third of its kind, after similar debt-swap programmes in Yemen and Egypt. 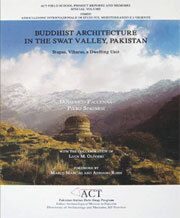 Buddhist Architecture in the Swat Valley is a memoir of two decades of Faccenna’s work in Pakistan. It investigates the building typologies that occur consistently throughout the 2nd century AD Buddhist Gandhara civilisation within the Swat Valley. To the common man, these are temples, courtyards, streets, and houses. To the technical expert, these are stupas and viharas, explored categorically via numbered excavation trenches. The book lists 14 stupas, four viharas, and a dwelling unit. Stupas are Buddhist tombs, usually capped by a large hemispherical dome. They serve one purpose, that of contemplating or praying for the dead. Viharas are a kind of Buddhist monastery with appendages for meditation, colonnaded corridors for reflective walks, and service rooms. The last structure the book defines is, “for want of a better definition,” a dwelling unit. This is probably a monk’s house or workstation. It is a small, two-storeyed, remotely located building facing east, with a simple front porch. It is a classic example of the small, single hermit dwellings that are widespread within the Barikot area as well as outside Swat such as at Takht-i-Bahi. The book looks at the specificities of construction for each building type — the materials used, the construction techniques employed, the influences adopted from other parallel cities outside the Swat Valley, and the gilding and ornamentation schemes on the most significant monuments. Within the chapters, each monument is described relative to its placement in the larger cluster of buildings it stands within, including GPS coordinates and an introductory note on how to locate it on site. This is sometimes followed by an anecdote on the history or the story behind the name of the structure or the area it is located in, derived usually from local folklore. The authors then talk about the structure in terms of its constituent architectural elements — the columns, the dome(s), steps, and external ornamentation — and the state in which these have survived. All along the text, refined hand sketches and field photographs eliminate the need for tedious descriptions and measurements. The sketches include plans, sections, elevation profiles and axonometric views of the structures that remain, followed by more recent digital econstructions. For some sites, a list of dates is provided for teams that have visited the site, along with their specific tasks. Some of these dates go back to the early 20th century. The Last Phases of the Urban Site is divided into two parts. It covers two different excavation sites within the Barikot area, a walled citadel dating from the Indo-Greek era. The urban site at Bir-Kot-Ghwandai has been labelled by the Italian teams as the most significant historic urban site that has been excavated to date within the Swat Valley area. The Buddhist sites at Gumbat and Amluk-Dara, which make up the second part of the book, are relatively less known but extraordinary in their richness of construction nevertheless. The close examination of these proto-urban structures also reveals the role of religion in the public life of Buddhist cities of the region. Core religious practices were intertwined with civic traditions and societal norms, apparent in the places allocated to worship only, for general religious gatherings, and places designated for specific rituals. The documented material itself is presented in quite an interesting way. The book contains a number of large, detailed flip-out sketch maps of the sites and colour coded scaled drawings showing street widths and wall thicknesses. Other diagrams show the levels of deterioration and erosion in the stone and brickwork, and calculated reconstructions of selected structures. Panoramic photos of the sites and drawings of individual structures also help the more technical reader judge the scale of the original construction relevant to the architectural drawing standards of today. In addition to the city-scale documentation, The Last Phases of the Urban Site also document artefacts, everyday objects like utensils, bangles and jewellery, statuettes, household décor, and game boards and pieces. Although the books explain findings that are fairly old, they offer learning opportunities for modern conservation students and practitioners in the very practical methodology of the teams’ field work and their innovative approach at tackling problems by involving the local social capital. Both books are quite technical in their overall vocabulary. They are best as archival records or case studies for students of architecture or heritage restoration, but can prove to be interesting reads for general audiences as well if the more technical parts are skipped over. The books collectively, though not exhaustively, sum up the efforts of decades of research and field work. There is also a list of future publications planned by the authors that draws on other unpublished records from the same sites. Regional tourism has always been an asset for the local populace of Swat, and the IAM looked to enhance this economic opportunity by contributing the findings from their research and excavation to improve local tourism. The overarching objective of the entire archaeological project, in the long run, was to generate economic opportunity by strategically intervening in the local community using heritage as a socio-economic commodity for consumers from outside the Swat region. Field activities by experts helped in the training and capacity building of the locals as well as students from Hazara University. The gain hence was not merely a skilled labour force but a heightened cultural awareness in the region in general. In this way, after the project has officially been concluded, these newly created professionals can move on to work on other archaeological sites, perhaps even setting up individual practice ventures in other communities. Global history requires details of local histories. It is only through thorough knowledge of specific local histories that a comprehensive global historical image can be created and propagated, as the IAM had set out to do. By studying local Buddhist sites in Tibet and Pakistan in detail, it aimed to generate a greater understanding of the historic religion on a global scale.